The Jeep Wrangler is the crowning achievement of the most recognized off-road automotive brand in America. An incredibly popular choice for adventure enthusiasts, the Wrangler has been an undeniable presence from the time it first appeared on dealership lots across the United States back in 1987. As popular as the Jeep Wrangler has been, it did not appeal to the convenience of every type of driver mostly due to its compact size. The rugged car brand decided to offer a version of the Wrangler that would solve the cramped space problem that was turning away would-be buyers, and introduced the first Wrangler Unlimited model in 2004. The first Jeep Wrangler Unlimited featured a wheelbase 10-inches longer than the standard Wrangler model from the same year, and afforded drivers a more ample cargo area and extended rear seat legroom for their passengers. While the Wrangler Unlimited was an exciting addition to the brand’s lineup right out of the gate, the best versions of used Jeep Wrangler Unlimitedmodels to buy started in 2007 with the JK generation. The car world today is constantly changing and adapting to better accommodate consumers, so that they can go about their daily lives as easily and as conveniently as possible. It seems that every time a new piece of technology is introduced, it is wise to wait at least a few months before lining up to buy the latest and greatest. Inevitably, problems with the emerging technology will arise, and tweaks are made to take care of these minor issues and fix any kinks in the system. The same reason why it was best to wait for the second generation iPhone to be released, is why we favor the second generation of the stretched-out Wrangler to purchase used. Jeep Wrangler Unlimited models from the JK generation can always be found here at The Faricy Boys dealership in Colorado Springs, Colorado. Starting in 2007 and extending to the present, used Jeep Wrangler Unlimited models from the JK generation are selling faster than dealerships can keep them stocked, because not only are they a great car, but they are available at a great price. In 2007, the entire Jeep Wrangler lineup was treated to a complete redesign, including the four-door Unlimited model. Replacing the outdated TJ chassis, was the all-new, wider JK platform. The Jeep Wrangler Unlimited JK model added 2.4-inches to its overall length from the TJ generation, and was 20-inches longer than the standard two-door Wrangler. This extended Wrangler offering appealed to off-road enthusiasts with families, and also to drivers who required extra interior cargo space that the traditional Wrangler was sorely lacking. The JK generation of the Jeep Wrangler Unlimited was introduced to the world at the New York Auto Show in spring of 2006, and represented the only four-door convertible available in the United States. Auto show attendees were impressed by the more convenient four-door Wrangler Unlimited, and Jeep began producing the newest rendition of the extended SUV in August of that same year. The Wrangler Unlimited JK did not just offer a longer wheelbase and four-doors, it offered more equipment and options than any other Wrangler that came before it. Inclusions such as electronic stability control, remote keyless entry, Sirius Satellite Radio, and more – the JK generation is hands down the best series of used Jeep Wrangler Unlimited models to purchase this year. Let’s take a closer look at the popular JK series of the used Jeep Wrangler Unlimited, so that you might discover which one is the right addition to your adventure-filled lifestyle. Offering a lot of exciting new changes from the underdeveloped Unlimited models that preceded it, the 2007 model year represented the start of the JK generation of the Jeep Wrangler Unlimited. 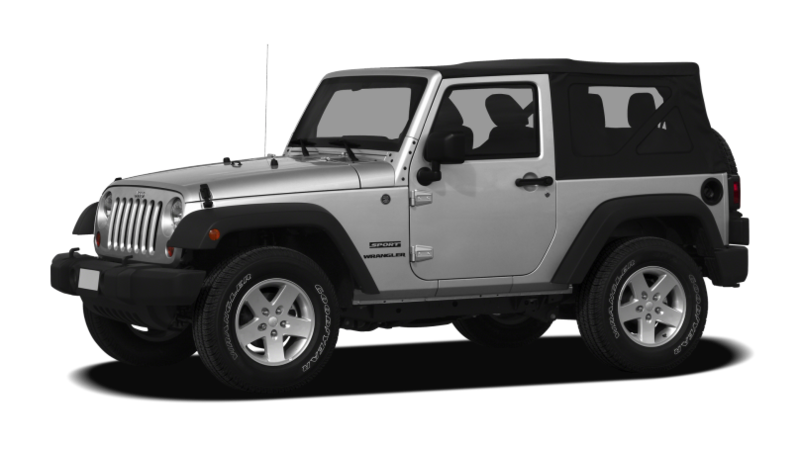 Featuring an overall addition of 2.5-inches to the wheelbase of the SUV, the 2007 Wrangler Unlimited was the first to feature four doors and have room for up to five passengers. Equipped with a powerful 3.8-liter V6 engine, used Jeep Wrangler Unlimited models from this year are capable of 202 horsepower, and 237 lb.-ft. of torque. Paired with a six-speed automatic transmission and all of the four-wheel capability Jeep is known for, the 2007 Wrangler Unlimited was an immediate force to be reckoned with, and truly a one of a kind vehicle. Still enjoying the complete redesign and introduction of the JK generation, this model year of the Wrangler Unlimited did not see any changes worth noting. The popularity of Jeep’s largest nameplate was increasing, right along with its sales. Minor updates are seen throughout the 2009 Wrangler Unlimited model, which serve to improve both convenience and overall safety. The third model year for the JK generation of the stretched-out Wrangler added new storage spaces throughout its interior, including a storage net incorporated into the dashboard, and a new bin in the center console for stowing larger items. Jeep made Hill Start Assist standard across all trim levels for 2009, and offered the Trailer Sway Control system as optional for the first time. Buyers who are more interested in overall storage convenience than the latest tech will find a used Jeep Wrangler Unlimited from 2009 an affordable choice. With in-vehicle technology on the rise in early 2010, Jeep pulled out every stop to ensure that the 2010 Wrangler Unlimited was up to par in every way imaginable. Standard on all 2010 used Jeep Wrangler Unlimited models, are an outside temperature gauge, tow hooks, fog lamps, front floor mats, and a full-length center console. Bluetooth technology with hands-free connectivity comes with the navigation system, and is the first time it is offered on the Jeep Wrangler Unlimited model. The Sahara and Rubicon trim levels offer optional leather trim and two-tone leather seating surfaces for the first time, and new colors were added to the palette of options. Finding a well-equipped used Jeep Wrangler Unlimited from the 2010 model year is easy to do, and depending on mileage – could end up saving you a lot of money right out of the gate. As the demand for the Wrangler Unlimited increased, so did its interior appointments. For the 2011 model year, Jeep added sound-deadening materials for a quieter and more comfortable ride, and upgraded the sound system to include USB connectivity with steering-wheel integration. The same 3.8-liter V6 engine that was first offered in 2007 still sits underneath the hood of this off-road capable SUV. Five years into the Wrangler Unlimited JK generation, the iconic brand made the decision to upgrade the engine underneath the hood of the four-door SUV. The brand new 3.6-liter V6 engine block produced 285 horsepower, and 260 lb.-ft. of toque. A massive increase from the outgoing 202 horsepower rating, the 2012 Wrangler Unlimited is capable of towing up to 3,500 pounds, and can be paired with a six-speed automatic, or five-speed manual transmission. Coming off of a new engine addition and a recent redesign, used Jeep Wrangler Unlimited models from 2013 are largely similar to previous versions. A few minor changes were made including upgraded seats featuring improved comfort, and an updated soft top that is easier to operate. Another model year with minimal changes, the 2014 Wrangler Unlimited added the option of a UConnect stereo system to the Sport trim level, which features a large 6.5-inch LED screen. Aside from this newly offered infotainment system, the 2014 Jeep Wrangler Unlimited is unchanged from the outgoing model. Once again unchanged from the previous model year, the 2015 Wrangler Unlimited is a worthy used option nonetheless. Offered in the base Sport trim level, the mid-level Sahara model, or the high-end Rubicon trim, used Jeep Wrangler Unlimited models from the JK generation do not disappoint. For off-road enthusiasts, a used Jeep Wrangler Unlimited Rubicon is your best bet for ultimate capability thanks to the standard sway bar, rear-locking differentials, skid plates, rock rails, and more. Essentially, you can’t go wrong with whichever trim level you opt for on the 2015 Wrangler Unlimited. The last version available for sale used, Jeep Wrangler Unlimited models from 2016 are a hot commodity for pre-owned buyers looking to get the most out of their money. The biggest change for the 2016 model year was the addition of the Black Bear special edition, which features a black grille, rock sliders, black 17-inch wheels, a leather-wrapped steering wheel, and more. It is the higher-end version of the rugged Wrangler Unlimited, representing the outdoors as much as it highlights interior amenities. If you have a heart for adventure but also appreciate the finer things in life, finding a used Jeep Wrangler Unlimited Black Bear special edition, might just be the vehicle you have been waiting for. The Faricy Boys is Colorado’s favorite Jeep Chrysler dealer, family owned and operated since 1942. No one knows Jeep better than we do, and we would love to work with you to find the perfect used Jeep Wrangler Unlimited model for your lifestyle. The Faricy Boys offers transparent pricing with no hidden charges, more than 73 years of expertise in all things Jeep, and unlimited car washes for sixty days after you purchase your used Jeep Wrangler Unlimited – or any other vehicle from us. The residents of Colorado Springs and the surrounding communities have been turning to The Faricy Boys for all of their automotive needs since 1942, and we are proud to be the top choice for new and used car shoppers in the area. Come down to see The Faricy Boys today, and take one of the many used Jeep Wrangler Unlimited models for a test drive. You won’t be disappointed!